If only accounting & taxes were as easy as pie! Let us take some things off your plate. Our goal is to provide the best tax and accounting services at a reasonable price. Let us do what we do best so that you have time to do what you do best! We are open year round for your convenience. Tax Season Hours are Monday through Friday 9 am to 6 pm and Saturdays 10 am to 2 pm. Non tax season hours are Monday through Thursday 10 am to 3 pm. After hours appointments are available upon request. We are conveniently located on Highway 43 in Saraland, across from Little Ceasars Pizza and Enterprise Rental Car. We provide service to: Axis, Bay Minette, Bayou La Batre, Chickasaw, Citronelle, Creola, Eight Mile, Grand Bay, Irvington, McIntosh, Mobile, Mobile County, Mount Vernon, Prichard, Saraland, Satsuma, Semmes, Theodore and Washington Co., AL and all 50 states. Call us at 251-679-9216 to schedule an appointment or drop by today! 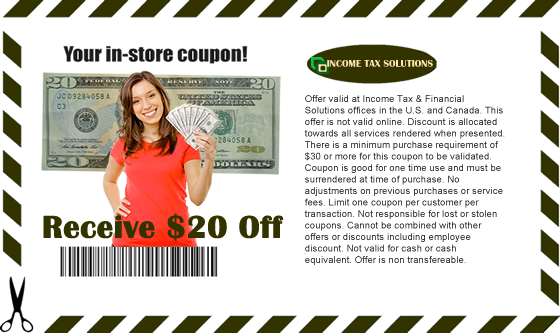 Income Tax & Financial Solutions, Inc. 327 Highway 43 North Saraland, AL 36571 All rights reserved.